8-day going train with anchor escapement. Striking train strikes full on the hour and once every half hour. Dial with Roman numerals fort he hours and Arabic numerals for the minutes. The bronze housing is attributed to François Vion. A French mantel clock in the shape of a vase on a sarcophagus shaped base resting on four feet decorated with leaf motives. The plinth is decorated with a beaded edge. The concave sides of the base are decorated with silvered bronze flower garlands tied with a bow. The oval shaped vase rests on an oval base decorated with beaded edges and acanthus leaves. On two sides the vase has handles in the shape of double flower stems with at the bottom bunches of grapes. The dial is framed in a flower garland tied with a bow. Overall the finishing and embossing shows great detail and quality. Charles Bertrand was born in Nettancourt and became one of the most prominent clockmakers of the Louis XVI period. Bertrand was trained by Eustache-François Houblin en became maître horloger on 20 February 1772, whereafter he settled at the rue Montmartre. He swiftly rose to fame because of the quality of his work and eventually appointed Horologer to the Royal Academy of Sciences. He specialized in skeleton clocks with complications. He worked with the best suppliers, among which were; Barbichon, Coteau, and Borel for his enamels, and de Saint-Germain and Vion for the bronze casings. A similar mantel clock was sold at the auction of Harenc de Presle in April 1795, that fits the description of the clock at hand. Vion was one of important bronze casters of the second half of the eighteenth century. He became a master in 1786 and specialized in clock casings. 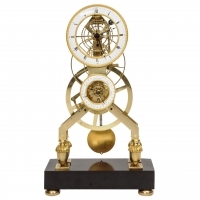 Many of his designs are refined mantel clocks, often with representations of animals.